Judd Foundation is pleased to present an exhibition of four paintings by Yayoi Kusama on the ground floor of 101 Spring Street in New York. The ground floor installation will be free and open to the public on Thursday, Friday, and Saturday afternoons from September 23 until December 2, 2017. Donald Judd was a friend and advocate of Kusama’s early work in the Infinity Net series, writing as a critic for ARTnews, “Yayoi Kusama is an original painter. 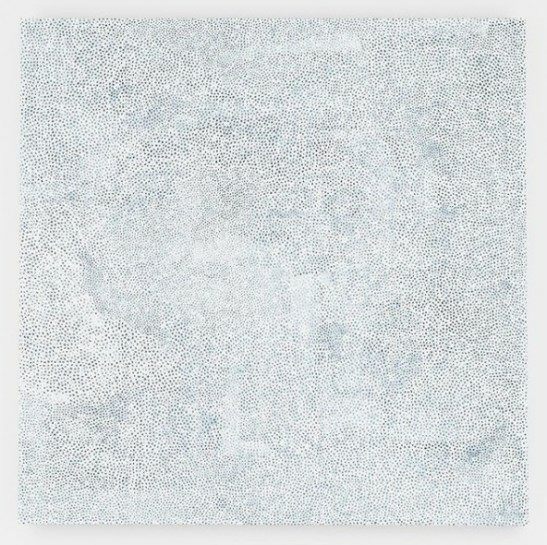 The five white, very large paintings [presented at the artist-run Brata Gallery in 1959] are strong, advanced in concept and realized.” The artists lived in the same building in the early 1960s, where Kusama constructed her first sculptural installations at the same time that Judd constructed his. The two artists maintained continued correspondence over the next two decades with Judd to visit Kusama while in Japan for an exhibition at Galerie Watari in February of 1978. Judd later installed an early ceramic work by Kusama, a gift from the artist, in his library at La Mansana de Chinati/The Block in Marfa, Texas. An exhibition of Kusama’s work at 101 Spring Street was discussed in letters between the artist’s studios in the 1980s, though not realized until now. Curated by Flavin Judd, the exhibition at 101 Spring Street includes recent and new works from the artist’s ongoing Infinity Net series. Image: Yayoi Kusama, INFINITY-NETS [AAKN], 2016, acrylic on canvas, 63 3/8 x 64 inches, 161 x 162.6 cm.